The First Folio was the original “Complete Works of Shakespeare”. It was compiled by two of Shakespeare’s actor colleagues, John Hemminges and Henry Condell and includes all of the plays today recognised as belonging to Shakespeare other than Pericles, The Two Noble Kinsmen and the two “lost” plays, Cardenio and Love’s Labours Won. It is generally believed that approximately 750 copies were originally published and, although there is some argument as to whether the publication was a financial success or failure, the First Folio rapidly became a most sought after book. Today, it has, of course, assumed iconic status as a direct line from the modern reader to the mind of Shakespeare and it remains the sole source of 18 of his plays, including the perennial favourites The Tempest, Twelfth Night, Julius Caesar and, most dear to me, Macbeth. Many theatre people believe that the First Folio, with its particular formatting and structure provides the best guide to how Shakespeare intended the lines to be read. (For a great description of this, you should check out Ben Crystal’s Shakespeare on Toast). Of the original 750 or so copies, 228 are known to still exist, according to the most recent census. The Folger Shakespeare Library in Washington, DC, has the highest number and the second largest collection resides in a specially constructed room at Meisei University in Tokyo. 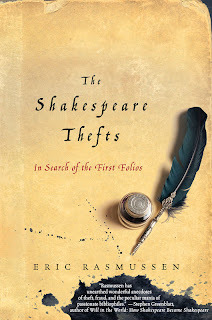 Eric Rasmussen is a noted Shakespeare scholar and led the team that carried out the most recent First Folio census, following on from a census taken by Sir Sidney Lee in 1902, which identified 160 copies. This team went on an obsessive journey around the world, tracking down and examining every copy of the First Folio to which they could get access. The fruits of their labour can be found in The Shakespeare First Folios: A Descriptive Catalogue, which describes in detail the physical condition of each copy as well as details of any marginalia found therein. As this volume is both dryly academic and would set the reader back around £225, it is likely that most people will find The Shakespeare Thefts more to their taste. This slim volume is a combination of anecdotes about the First Folio, memoir of the taking of the census and discursion on extreme book collecting. Rasmussen’s hook is that, of the 160 copies of the First Folio identified by Lee, 14 of them have since gone missing, mostly through theft. Some of these thefts are discussed in the book, including Durham University’s copy, which turned up in the possession of a self-proclaimed millionaire who actually lived with his old mum in a North-East terraced cottage and an American copy stolen so that it wouldn’t end up in the hands of Hitler. The slight snag, however, is that most of the book is about copies that weren’t actually stolen but just have interesting stories attached to them, such as the RSC’s copy that was accidentally purloined by the Pope or the Meisei copy that has a bullet hole in it or…I could go on but that would start to spoil it for you. One of the most fascinating nuggets of First Folio lore recorded by Rasmussen is the fact that there are missing copies that were once owned by the Herbert brothers, the dedicatees of the First Folio and William Beeston, son of Christopher Beeston, a member for a while of Shakespeare’s acting company. As so many of the First Folios contain marginalia by their owners, who knows what may have been written into these copies. Notes on Shakespeare’s stage directions? Emphasis marks on the “To be or not to be” line in Hamlet? Although they may well have been lost forever, there is still the tantalising possibility that they lie, undiscovered, in an English attic, abiding their time. The Shakespeare Thefts is a gossipy, light, easy read about the First Folio and bibliomania in general. That is both its strength and weakness. I would have liked more meat in it and less froth. Many of the stories are skipped through more rapidly than they deserve and there is almost an air of this being a set of magazine articles or notes for an as yet unfinished book about it. There is also a little too much unnatural levering in of stories about Rasmussen and his team which I felt distracted from the book as a whole (and that is no disrespect to the amazing work they have done). Nevertheless, the cast of reprobates, eccentrics, bibliomaniacs and historical figures who parade through this book make it an entertaining read for anyone with an interest in Shakespeare or book collecting. I really enjoyed reading this -- as you say you did -- but would agree that it's light tone didn't quite do it credit. I too wanted a little more from the stories too.